Never has it been easier to go on a trip, take tons of photographs and share them with family members, friends, colleagues and even strangers. With the array of easy-to-use digital cameras available, you can get some phenomenal photographs just by snapping away while on vacation. But how do you get the mesmerizing shots? The ones you want to frame? Layne Kennedy, a fine art/editorial photographer based in Minneapolis, has traveled extensively, capturing the faces and the landscapes of different countries around the world. Here, he shares some of his secrets. Don't be afraid to ask people if you can take their picture. For the above photo, I had just gotten off a ferry on the Aran Islands in Ireland. 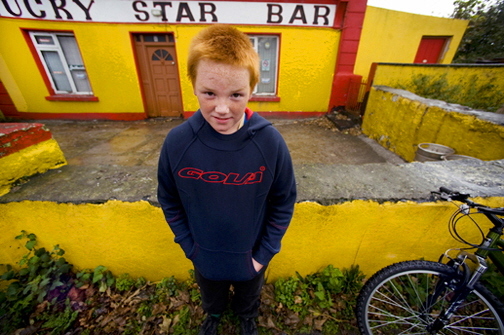 I saw a red-haired and freckled kid on a bike and called out to him. Had I not said anything, he would have just pedaled by. In Iceland's Blue Lagoon, I saw a woman who seemed to really be the voice and face of how I imagined Icelandic women. To get her to agree, I had to take the chance, risk rejection, and ask. Many people are nervous about having their photos taken, but digital cameras can help. Show them the pictures and offer to e-mail them the images. Don't just sit and watch, experiment. When I saw these paddlers on the Amazon, I wanted to get them but it was too dark to use a hand-held camera and there was not enough time to set up a tripod. 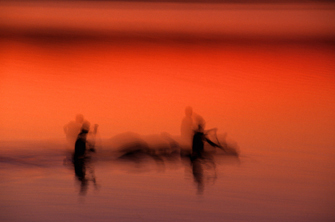 I panned them as they moved, a six-second exposure, crossing my fingers that I'd get an image you could identify. I love the mood. Go hunting for pictures. It's very simple. You gotta have your camera and you gotta be there. This picture was taken on Anguilla and I happen to see a woman on her own, wearing a bathing suit that matched the water. Get in close and tight. Many people are afraid to take close-ups, but it's important to get in close to show the personalities. And don't be afraid to shoot off to the side. By shooting from the side, you get three dimensions, rather than just two, which you would get from shooting straight on. 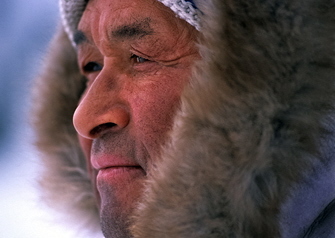 By pairing this close-up of the leader of a village in Greenland with the next photo, which gives you a sense of place, you are telling a story with your photos. Don't be afraid to shoot into the sun. Though all the photo books tell you not too, you can get some incredible photographs by shooting into the sun. I took this dog-sledding shot on frozen Baffin Bay in Greenland. Don't just look for the pretty pictures. Document history. 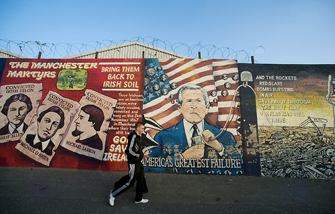 This graffiti wall in Belfast, Northern Ireland, speaks volumes about the culture, about potential conflict. When you take pictures like this, it's important to take them as they are. Show the barbed wire and the stuff you might normally crop or edit out. Take the shots you might otherwise skip. Rather than go home and talk about all the rivers you had to cross while hiking in Jamaica, show this. These kinds of pictures are the nuts and bolts that tell the story. Get down low. They say if you want to get a great dog picture, you have to be a dog. 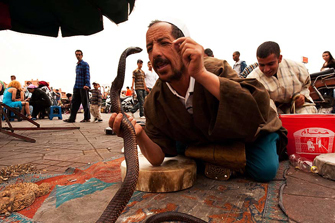 For this photo taken in Marrakesh, I didn't want to get the cliche snake charmer photo every tourist goes after. By kneeling down, and changing the perspective, I was able to isolate the snake's head against the sky, making it a much more dynamic image. Keep an eye out for the simple shots all around. Try not to complicate things. 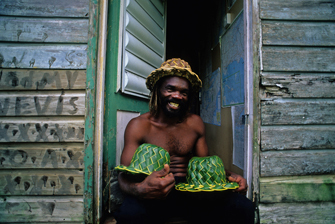 There are many shots to just grab as you go along, like this hat maker in Nevis I came upon. Take advantage of overcast weather. This shot was taken in Alaska on an overcast day. Often times, that light is the best quality light. It can be spectacularly soothing without the harshness of sunlight. Keep in mind that shots like this one might be in your back yard. Keep your eyes open at all times. 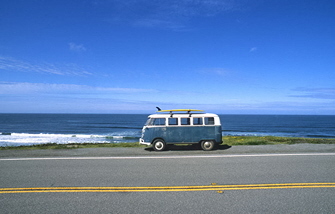 I came across this VW bus while trying to find a way down to the beach. While I normally like to have people in my photos, this one does not have anyone in it. Still, with the surfboard on the roof, it speaks volumes about the people. Lastly, follow your instincts. Shoot for yourself. Shoot what makes you happy. Trained in fine art photography, Layne Kennedy is known for his editorial photography that conveys a strong sense of place. 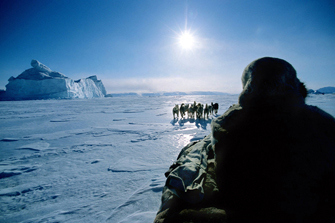 His images are featured in magazines worldwide on subjects as varied as Pink Dolphins in the Amazon River to traveling with Polar Inuit hunters by dogsled. Layne leads a variety of travel photography workshops that include teaching students to shoot pictures while dog sledding, canoeing and sea kayaking. All of the workshops focus on creating story-telling imagery. For more information, follow these links. If you've missed the most recent one, check back for new dates. 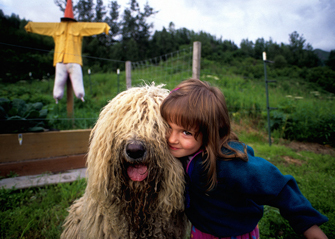 Layne also leads photography workshops at the North House Folk School in Grand Marais, Minnesota and at the MPLS Photo Center in the Twin Cities, Minnesota. Need Help Planning Your Trips? Call us at (203) 247-2317 (EST) or e-mail us here.